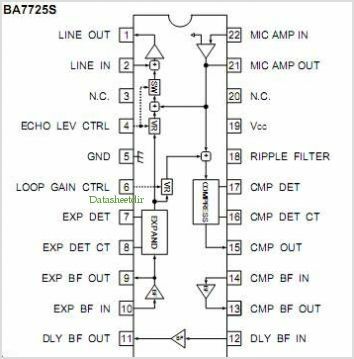 The BA7725S and BA7725FS are Analog companders designed for KARAOKE echo systems, and logarithmically compress the signal level by 1 / 2 and then logarithmically expand it by a factor of 2. These ICs CAN be used in com- bination with the BU9252S or BU9252F to create a digital echo system. These ICs have an internal line mixer ampli- fier for mixing line input and echo signals. The internal electronic Volume Control makes it possible to adjust the mixer level and loop level mixer with an external DC voltage. By ROHM Co. Ltd. This is one package pinout of BA7725S,If you need more pinouts please download BA7725S's pdf datasheet. BA7725S circuits will be updated soon..., now you can download the pdf datasheet to check the circuits!